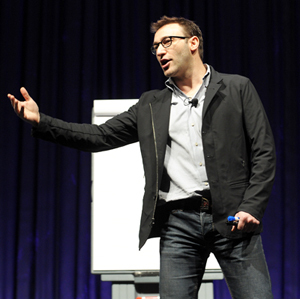 The Big Ideas series, a new morning lecture program debuting at PLA 2014, kicked off on Thursday, March 13, with a talk by writer and motivational speaker, Simon Sinek. The author of Start with Why: How Great Leaders Inspire Everyone to Take Action and Leaders Eat Last and a popular presenter on TEDx, Sinek drew from history, current events, science, anthropology, and business to detail how successful leaders and positive leadership are made. Using life in the Paleolithic era as a springboard, Sinek explained how we are all products of responses to our environment. Trust was a powerful survival tool for our ancestors. They formed tribes, led by alpha leaders, to protect them against danger. By placing trust in their leaders, ancient communities developed and prospered because they didn’t have to worry about these external stressors. The business world works in much the same way, he said, with bosses standing in for tribal leaders to inspire and protect employees. If trust is missing, a company will falter. But how is trust built? It’s all biology, according to Sinek. Our bodies possess a chemical incentive system that creates happiness—and, in turn, trust—via four chemicals: endorphins, dopamine, seratonin, and oxytocin. Avoiding science jargon in favor of anecdotes and humor, Sinek explained each of the four reactions and how they apply to our lives, both in and out of the workplace. The endorphin rush felt after a vigorous pursuit, either during a footrace or on the trading floor of a stock market, will make us want to do it again and again to produce similar results. The instant feeling of satisfaction caused by dopamine after achieving a personal goal will lead to more achievements. The seratonin released after we’re recognized and acknowledged by others in public (through praise or awards) produces feelings of self worth and a desire to serve those in alpha positions. And the oxytocin produced when we make physical contact with others (a handshake at the end of a business deal, for example) produces feelings of love, friendship, and ultimately, trust. Sinek explained that man is naturally hierarchical, and betas allow alphas to lead. Seratonin plays a part in this. However, we are not stupid, said Sinek. “The group expects alphas to step forward to lead when it matters,” he said. If those leaders fail, the group suffers. Sinek cited the 2008 financial crisis as an example, when many business leaders fired or laid off employees to maintain the bottom line. “A great leader would never sacrifice people for the numbers; they’d sacrifice the numbers for the people,” he said emphatically. Sinek also discussed the archnemesis of the four happiness and trust-building chemicals: cortisol. Cortisol is our early warning system: the nervous energy we feel when threatened. It give us our fight-or-flight response. It keeps us alive when in danger, and it’s also released when we work in unhealthy work environments. Too much cortisol in the body creates stress, destroys empathy, and breaks down the immune system. “Our jobs are killing us,” he said. Effective leadership eradicates the cortisol buildup and creates an effective, productive workplace. It can also be infectious. Sinek spoke at length about the positive and lasting effects of better leadership. By treating everyone in their lives with kindness and respect, by creating oxytocin everywhere, a new generation of leaders will beget subsequent generations.